﻿ Hocking Hills Family Fun Center - Ohio. Find It Here. Perfect for group outings, family get togethers and company picnics, the Family Fun Center offers a wide range of activities in one place. We have go-kart rides for every age and skill level, an 18 hole miniature golf course, a game room, Splash Pad, and pedal cars. Shelter houses are available for anyone to use and can be reserved for special events. Sand volleyball, horseshoes, and kickball are available for our guests to enjoy for free during their stay. For those who want an all day adventure; try our Family Fun Package, including the Trip 1 or Trip 2 canoe or kayak ride and any 3 Fun Center activities. 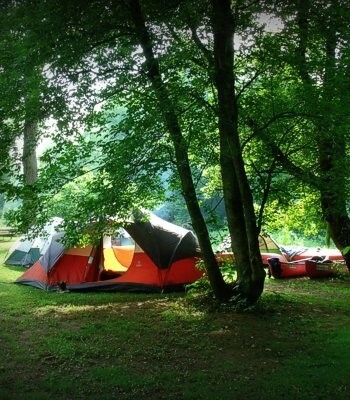 Cabins and camping are located at the Fun Center to make your stay in Hocking Hills easy, fun, and affordable.